The Batak tribe of warriors who inhabit Nias had been Stone Age hunters with a sweet tooth for human heads in the 17th century. Megalithic culture still flourishes today. Five thousand islanders, although converted to Christianity by Dutch Protestant missionaries in the late 19th century, greet me and my wife, dressed to kill. "Johong," he grunts, extending a spear gripped in an arm muscular from the weight and tight fit of oxhorn bracelets. His bellybutton protrudes below a black wooden breastplate, and his face and head are concealed within a huge molded mask garnished with hair and teeth that are shocking white. "He wants you to dance with him, honey," nudges my wife, Anne, pushing at the dimple on the right side of my tush, an indentation which occurs only when my back is extremely arched. A crowd of Indian Ocean islanders dressed festively in orange waistcoats and red culottes surrounds me as I touch the spear. Just then, drums, or my heart, or both, begin to beat to the rhythm (but not the tune) of Rebbi Elymelech Iz Gvoren Zain Freilich. As for Annie, she is now in imminent danger for her life...at my hands, when she too begins clapping and yelling, "Johong; Johong!" I do not frighten easily which is why I cannot yet understand how I came to be screaming back, "SHE'S A VIRGIN, SACRIFICE HER!" My wife reacts demurely by swooning and placing the back of her hand to her forehead as if there were a possibility of such a conclusion after forty-five years of marriage to me. I admit now that I may have overreacted, but despite my remorse, the crowd begins to part. Fifty yards dead ahead, behind the swarming people, is a huge rock column eight feet high on whose top is staked a spike of bamboo. It is not "Johong" they are chanting, I discover, it's "Juhump, Juhump, Jump, Jump, Jump." Nias villagers perform war dances, the Tulo Tulo, a spectacular of crocodile-teeth necklaces, charging men and stomping (former) headhunters. The culmination of the extravaganza is the “stone-jumping,” where one man is selected to hurl himself over the aforementioned stone column avoiding disembowelment on a bamboo spike at its apex. The drums are pounding bone deep while two dozen men with pigs' jaw masks surround me. Before I can complain, my pants have been replaced with a leather loincloth and my face is covered by a black-haired headpiece from which hangs a mask exhibiting rhino horns on its cheeks. I take my shirt off myself. "I CAN DO THIS," says the Philadelphia lawyer in me. My wife has joined in a line of women in yolk yellow and crimson sarongs, gaudily emblazoned with gold bangles. They all dance devilishly. She winks. Allow me to backtrack a second. My adventures in Indonesia’s Spice Islands started in Singapore. I had walked miles along Orchard and Tanglin Roads visiting shops and merchants in order to ferret out the locals' choices for fine dining, a fabulous strengthening of the leg muscles. I dined solely on exotic fruits, broiled local fish, crab salads, fresh vegetables, skinless chicken saté and occasional lean meats. Thereafter, I had swum miles along beaches in Phuket and Bali. 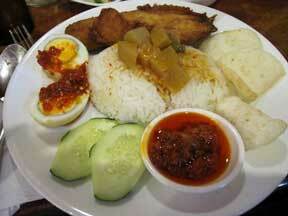 At stops for lunch in Penang and Padang I am nourished by rice with shrimp, chillies and warmed coconut sauce. Non-fat vegetable salads (gado-gado) are a staple with sides of ground peanuts, palm sugar and touches of fermented soya beans. If I overindulged at all, it's with fruits: rambutans, mangosteens, salaks, marquisas, mangoes, dukus and infamous durians, all of which are sold for an Indonesian rupiah at stalls in Jakarta. 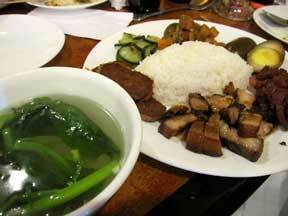 Frankly, I had reached a carbohydrate peak and a limberness made exquisite by Java Seas' swimming. My physical and mental condition was that of a Batak warrior about to perform a once-in-a lifetime feat. I am told that my right fist reached and surrounded the bamboo spike at rock-top while the rest of me adhered to the bowling-ball smooth stone by the suction created at impact. Sheer determination kept me crawling and groping upward in unconscious slow motion. My activity caused nothing more than the slippage of the loin cloth. Just before the latter's complete departure, my wife grabbed my legs and bench-pressed me high and hard over to the other side. As dazed as I was, I heard her come to my side and whisper into my ear, "Honey, don't lose your head, I've got the case on a one-third contingency." 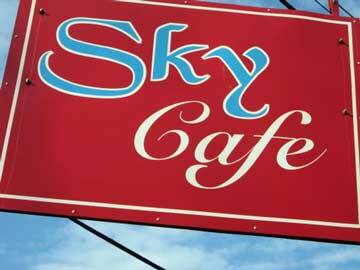 Sky Café’s informative picture-laden Menu is divided among three pages, “Noodles,” “Rice,” and “Starters or Sides.” Begin with Chicken Satay ($6 for 5 skewers). 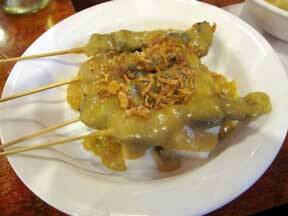 Before your eyes appears a peep of choice chicken chunks embellished with piquant peanut sauce. 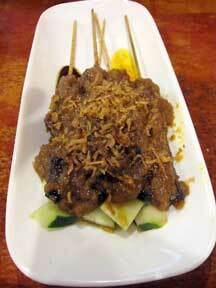 Or Satay Padang ($6.50 for 4 skewers) of “beef” (actually tongue) served under golden curried caresses. Never miss the Wonton Soup ($3) nor vegetarian Spring Rolls ($3) which make Chinatown’s concoctions amateurish in comparison. 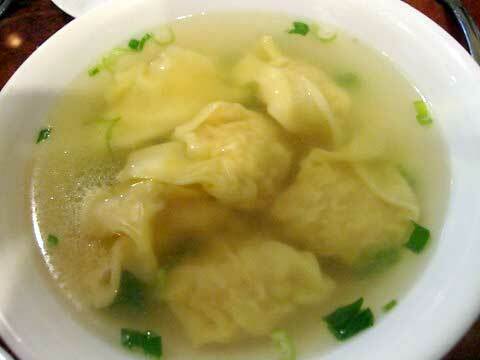 The dumplings are silken-skinned, the rolls overtly crispy; the soup is crystal clear. It’s as if your lips were deliciously kissed. The “Noodles” here are homemade and breathtaking. Attempt to get various assortments of “Egg Noodles”, thin or flat, in a bowl engorged with (inter alia) ground chicken, pork, sausage, Medan meat balls, fish balls, shrimp, squid, mushrooms, fried tofu and vegetables. It seems as if you are hugged by the Spice Islands. Sky’s “Rice” platters ($6-$7.50) are boisterously partnered with boiled eggs (some to a purple hue), anchovy, barbecued meats and fried fish, tempeh, potato patties, crackers, pork belly and pickles. 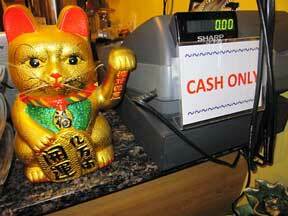 Avoid nothing; and the wait staff will never lead you astray. They will be playfully helpful by noting what edible might be too extraordinarily peppery-hot or too unsavory-smelly or pungent. Don’t worry. This luncheonette-looking lair launches legal-ease. Simply arm yourself with hundreds of freely available paper napkins, just in case your loin cloth begins to fall.